Syringomyelia. Hemilateral incidence of the spinal cord (gliosis unilateralis). Very interesting, distinctive case of unilateral and strictly unilaterally expressed syringomyelia with wide prospering tropic dysfunction in the hand of the affected side, ulcers, callouses, necrosis of the phalanges and mutation of the finger joints (Morvanic form of the sickness). 62 year old, hereditarily unimpaired worker, who was never before seriously ill. Onset of the affliction 17 years ago with stubborn ulcers, blisters, and cracks of recidivate paronychia appearing on various places of the left hand and fingers, which passed nearly painlessly and would happen without especial sentiment for the patient. Patient even pulled the dead bone fragments from his ulcerous fingers by himself with no significant pain. It would have been at this time or a little earlier that the sensation of weakness in the left arm occurred and the deflection of the vertebrae commenced. The right side was and is remaining completely clear. Plates 18 and 19 offer front and back views of quite typical pictures of the entire figure. 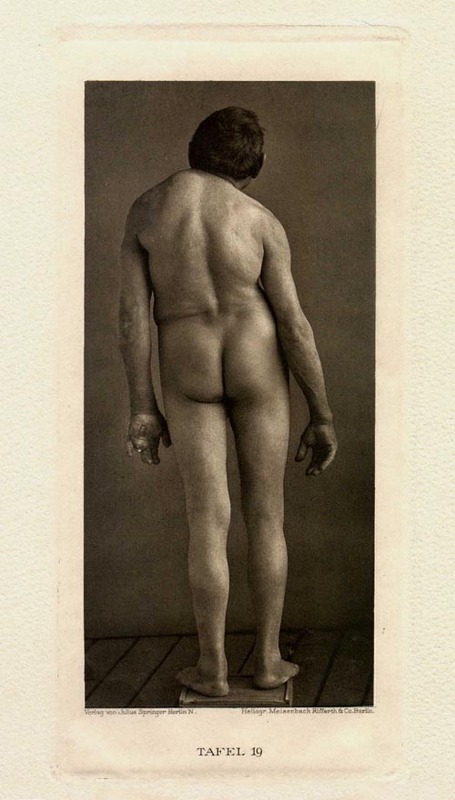 They show the severe scoliosis, the strange physiognomy with the pinched back left eye, the deformity of the left hand by comparison to the unaltered right. Plates 20 and 21 again give enlarged examples of the most interesting mutations. As is so often observed for the condition of the disease in question, plate 20 shows the substantial, as yet unexplained, stricture of the lid crack and pupil of the succumbing side ( with vision completely sustained ), while plate 21 allows comparison of the sick hand with the healthy. 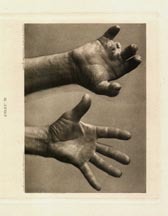 The photograph of the sick hand renders with exceptional fidelity the ulcerating, partially scarred defects in the fingers and in the hollow of the hand, the general thickening of the skin, the swelling up of the wrist and of the metatarsophalangeal joints as well as the deformity and swelling of the thumb with the subluxation of its end phalanx. Closer inspection by nearly unhindered probing of the patient resulted, firstly, with the familiar, utterly typical impairment of sensibility, strictly limited to the left upper half of the body: sizeable depreciation, even complete absence in one place, of the sensation of pain and temperature. For the most part, pain and temperature sensation was impaired in the left hand right up to the middle of the forearm. 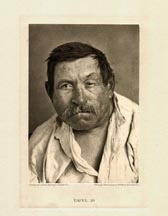 Considerable degradation was found also in the left side of the throat and on several places of the back. The areas with degradation of heat sensation were somewhat greater than those of the analgesia. In reference to sensibility and motility, both legs behaved completely normal. Because of the ankylosis of the hand and finger joints, it was not possible to determine muscle performance in the left hand and forearm. Additionally, the palpation and electrical examination of the hand muscles was nearly inexecutable owing to the significant thickness of the skin.